Charles Mortimer played Hilary Fairfield in "A Bill of Divorcement" in 1922/23. 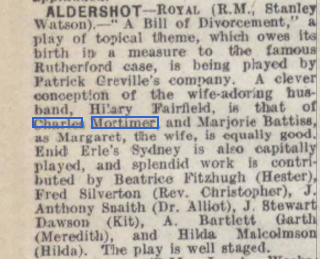 However, according to the Hull Daily Mail of 6 December, 1923, the lead was played by Gordon McLeod. The Leeds Mercury indicates that Mr McLeod has the lead at the Theatre Royal, Leeds in November, and he was in Scotland in late August in the play. 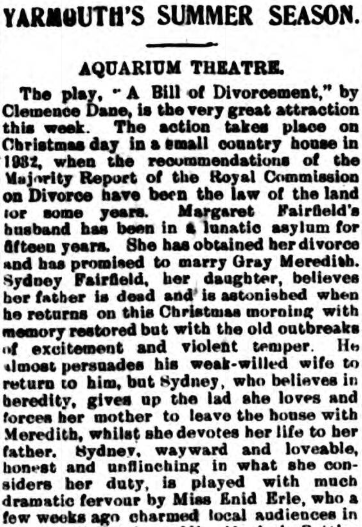 A Bill of Divorcement is a British play written by Clemence Dane that debuted in 1921 in London. Dane wrote it as a reaction to a law passed in Britain in the early 1920s that allowed insanity as grounds for a woman divorcing her husband. From The Era of 2 August, 1922. "A Bill of Divorcement" played at the Royal Opera House, Leicester, during this week. The play was also produced at the Cheltenham Theatre and Opera House, in the week of 30 May 1922. According to the Gloucester Citizen of that week, "a particularly strong and convincing study of the lunatic husband is given by Mr Charles Mortimer," and " the play is preceded by a dramatic episode in which Miss Erle and Mr Mortimer interpret the characters". Newspaper article from the Devon and Exeter Gazette of 19 August, 1922. From the Era of 21 March, 1923. "Mr Charles Mortimer gives an exceptionally fine study of Sidney Fairfield, the husband". 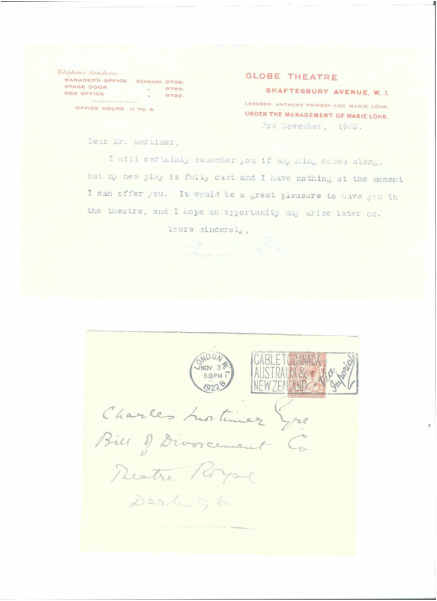 This letter was sent to Charles Mortimer at the Theatre Royal, Darlington, in November, 1922, when he was in the cast of the play. Clemence Dane, Noël Coward wrote, "manages to wreak more havoc in a small space of time than an army of delinquent refugees". She ditched her real name, Winifred Ashton, for a nom de plume in honour of her favourite London church and, by the time she wrote her first play, she had already been a teacher, painter, novelist and actress. The shows she starred in were generally high on exclamation marks: This Way, Madam! and Oh, I Say! were two successes. She was inspired to write A Bill of Divorcement by changing legislation, and she set her play in an uncertain future. As the Bystander's critic (who called himself "Jingle") put it: "We are asked to suppose that the recommendation that wives should be permitted to divorce insane husbands has become law; and we are then shown the effect of the law about 10 years hence." It was a risky strategy, not least because, as Jingle went on to cavil, "while the action is supposed to pass in 1932, the ladies are wearing 1921 frocks". He speculated that perhaps this was because "even the most imaginative fashion designers shrank from suggesting the kind of frock that will be worn in 1932, since, at the present rate of shrinkage at both ends, frocks may travel far in 11 years". But writing about divorce was bound to get people talking about more than hemlines. Sydney Carroll, writing in the Sunday Times, found the play "intensely interesting, stimulating and provocative ... the work of a thinker" and left it "perplexed, disgruntled, as protesting as if we had seen a slice of life itself. Artistically, that may be a merit. Theatrically, I fear it is a fault." WA Darlington, who reviewed it very positively for the Telegraph, looked back on it in 1960 as "sheer journalism, almost social propaganda". Its very topicality would ensure it did not last. None the less, at the time it was so popular that it ran for 401 performances. "Seldom," wrote the Era's critic, "has any play been so keenly followed - and so keenly borne in mind after the last curtain has gone down on it." Meanwhile, Jingle "noted as a rather curious sign of the times that all the laughs at the expense of the church and its narrow dogma were both spontaneous and hearty". The Stage's critic rather prissily based his review on Aristotle, concluding that: "Miss Clemence Dane has, as may be observed, adhered to the Unities of Time and Place." However, he did praise the acting. It was Meggie Albanesi who won the most plaudits. Jingle was overcome by "acting so poignant and so terribly convincing", Carroll found her "talent in jumping from comedy to tragedy ... little short of astonishing" and the Times's critic praised her delicacy: "Not a note was forced .... there were tears in our eyes." Albanesi exemplified the new restraint, as Darlington wrote: "You could see little of her emotion but you felt that she was tearing her heart to pieces." When she died two years later at just 24, the critic James Agate summed up her appeal: "You felt that she had not only thought out her parts, but fought them out within her own bosom." Restraint was not a quality much associated with Dane, who was notorious for her schoolgirl slang, her unintentional double-entendres and her wild arguments. She once dug a fork into her own neck to illustrate Shakespeare stabbing Marlowe, and wrote a cavalier Bard biodrama, Will Shakespeare - An Invention. 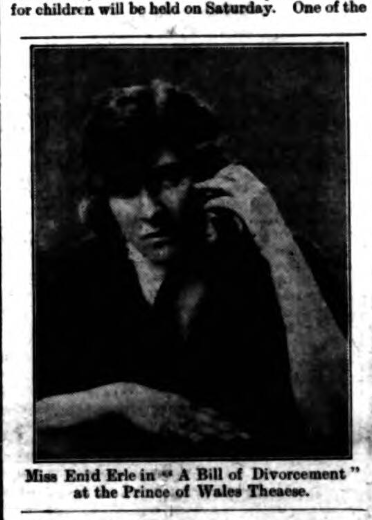 Like her other plays, it never hit the heights of A Bill of Divorcement, which was filmed three times: a silent in 1922, a 1932 hit that gave Katharine Hepburn her screen debut in Albanesi's role, and a flop of a remake in 1940. Dane was immortalised by her friend and fan Coward as Blithe Spirit's dotty medium, Madame Arcati. From the Yarmouth Independent of 22 July, 1922. Taken from the Rugby Advertiser of 10 November, 1922.